I’ve put up an interview with Dr. Brian Cox, ‘Sunshine’s’ Science Advisor at the end of this post. His job on ‘Sunshine’ involved discussing the science of the film with Danny Boyle and Alex Garland well before the script was completed in order to make sure that the concepts and terminology used were correct. The interview explains how the Sun could die prematurely. The following was put together by Alex Garland after many discussions with Dr. Brian Cox. It explains, very simply, the background science in ‘Sunshine’. Q: WHAT IS WRONG WITH THE SUN? A: A Q Ball is eating the Sun from the inside out. Q: WHAT’S A Q BALL? A Q Ball is a super-symmetric nucleus, produced in the early Universe. That is to say, a nucleus made up of super-symmetric particles, formed shortly after the Big Bang. Q: WHAT ARE SUPER-SYMMETRIC PARTICLES? They are the super-symmetric counterpart to ordinary matter. Q: WHAT IS ORDINARY MATTER? Ordinary matter is what makes us up. Ordinary matter is constructed of atoms. The nucleus of an atom is constructed of protons and neutrons. Protons and neutrons are, in turn, composed of quarks. Quarks are elementary particles. Protons and neutrons are each composed of three quarks. The super-symmetric counterpart of a quark is a squark, and the Q Ball is composed of squarks. Q: WHY IS THE Q BALL SO DANGEROUS TO THE SUN? The protons and neutrons of ordinary matter would ‘rather’ be squarks. When ordinary matter is placed in close proximity to a Q Ball, the protons and neutrons are disrupted, ripped apart, and turned into squarks. In other words, a Q Ball turns ordinary matter into itself. And unless it was stopped, this process would eat the Sun from the inside out, until a critical mass had been reached, at which point the Sun would explode. Q: ARE SUPER-SYMMETRIC PARTICLES AND Q BALLS REAL? This question should be answered by work that will be undertaken at CERN, the world’s largest particle physics laboratory, which has its headquarters in Geneva. In 2007, scientists will use the laboratory’s vast particle accelerator to search for super-symmetric particles. It is considered very likely that they will find them. Q: IF Q BALLS EXIST, DO THE REALLY DESTROY STARS? It is speculated that the origin of gamma-ray bursts may be the cataclysmic destruction of neutron stars by precisely this method. Gamma-rays are the most energetic form of light, and are produced by events such as supernova explosions. Q: HOW WILL THE ICARUS MISSION STOP THE Q BALL FROM DESTROYING THE SUN? The Icarus mission carries a Stellar Bomb, which it will detonate in the Sun. The bomb will destroy the Q Ball. Q: HOW WILL THE STELLAR BOMB DESTROY THE Q BALL? The bomb creates the same super-heated conditions in which the Q Ball was made. To be specific, Q Balls were formed at a particular time after the Big Bang: 10 to minus 35 seconds. The heat at this moment of the Big Bang was 10 to the power of 32 degrees. By recreating these conditions, the Q Ball will split up, separating it into squarks. Squarks on their own decay quickly into normal or stable (benign) supersymmetric particles. Put simply, the Stellar Bomb makes the Q Ball fall to bits. Q: WHAT IS THE STELLAR BOMB MADE OF? Dark matter and Uranium. In the same way that an atomic bomb uses normal explosives to trigger uranium into a nuclear explosion, the stellar bomb uses uranium to trigger the dark matter. In the film Sunshine, mankind has been able to construct two of these Stellar Bombs. The fact that the Stellar Bomb uses uranium is the reason that mankind is limited to only two payloads â€“ because Earth does not contain enough uranium to build a third. We don’t know, but we have considerable gravitational evidence that it exists. Simply put, the gravitational effects that we can observe in the Universe require much more matter than we can see. Because we can’t see this hidden matter, it has been termed ‘dark’. Dark matter might make up as much as 95% of the Universe. It is widely speculated what dark matter actually is. Planets, dim stars, neutrinos, exotic particles, and weakly interacting massive particles. But Q Balls are a good candidate. Q: ARE THERE ANY CAVEATS ABOUT THE SCIENTIFIC BACKGROUND TO THE FILM? There are, not least because the film assumes that large areas of theoretical physics are correct. In addition, the Sun may not actually be dense enough to stop a Q Ball, but for the purposes of the film, we assume it is. Also, the rate of ‘eating’ is proportionate to the density of Sun – so the rate might be very slow. 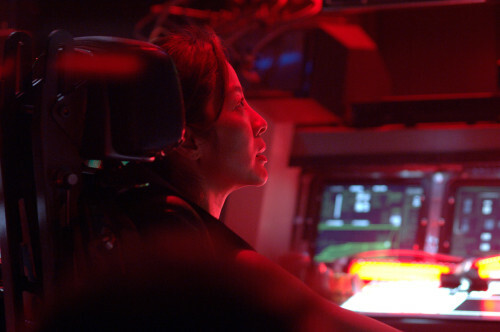 It’s Michelle Yeoh’s birthday on August 6th. To celebrate, I’ve got a lovely new photo of her from ‘Sunshine’ for your enjoyment.